50 registered members (bbhero, 87sammy, Bailes1992, 53' Stude, 2015_PSD, askani79705, 5 invisible), 713 guests, and 23 spiders. I promised I would do it, and it's come back. 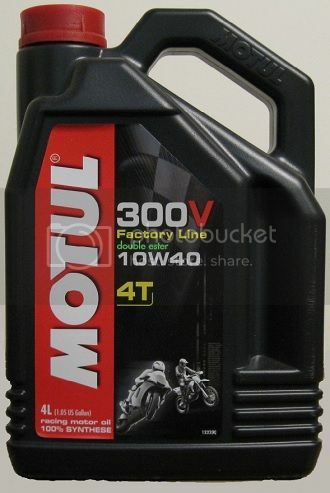 Motul 300V 4T Factory Line 10W40 motorcycle oil. It ran very well for the full distance to recommended oil change, almost 3500 miles. So I sent in an unused sample from the same 4L jug as the original came from. The oil seemed to lose it's anti-freeze neon green tint with time after it was opened, whether it was in the bike or the jug in my garage. So far they like the VOA, but my observations are more directed towards the additive package which seems a good bit weaker than the competing weight Redline 4T offering, especially in the Zn & P anti-wear dept, where it appears this could merely be a low additive API SN or one of the A3/A5's or a 228.51. Also was rather surprised to see the 455�F flashpoint, thinking it would have been closer to 475-490 range. Anyways, the UOA should be along any day now, the VOA & UOA were sent at the same time. I thought Motul put a lot more moly than that in it. That is good that there isn't a ton of moly in it, however. The car oil v300 does. I knew they had to be reducing moly on the MC oil to meet MA gate, I suspect redline ma is the same way. Both redline and motuls car oils are way up there in moly 500 +ppm. and my own tests show a distinct difference between redline car oil and the redline MC ma oil, hoping to see a uoa on that. I presently have a batch with 2,000 miles on it. Last edited by Mackelroy; 04/12/14 07:28 PM. Is this the new 300v with Ester Core formula?Hope to see your uoa soon,I hardly see any Motul 300v uoa. Is this the new 300v with Ester Core formula? I believe this is Motul's previous version, the double ester formula, which I think was produced from 2008 - 2013. I recall an announcement stating it would be superseded by the ester core formula which became available in August of 2013. Is the changeover more than a marketing ploy? Someone else will have to experiment to see, as I currently am running the double ester formula and have 5 more 4 liter jugs to go. I like it that much. I couldn't agree with you more that Motul is the best oil i ever used. However many said 300V is design as race oil with very short oil change interval that is not suitable for daily street usage. Your UOA definitely clear some of my doubt. Thanks for the VOA CentAmDL650 and nice assessment! I too was expecting the 300V to have a more robust add. pack (especially when compared to Redline) but it looks like a solid oil none the less. Since it meets JASO MA certification technically the Phosphorus levels are within spec. (0.08-0.12 PPM) but are definitely on the lower end of the spectrum. Perhaps with the subsequent decrease in ZDDP they added in the higher amounts of Boron as the extreme pressure additive, upped the Moly as the AW additive and to also help reduce friction...thus possibly making their claim that upwards of a 3% increase of power can be achieved (plus as you stated earlier, starting out at the lower end of a 40 grade oil might also help meet that claim via a decrease in viscous drag). Otherwise, there's a nice dose of silicon for racing conditions, the TBN matches up, and their flash point of 464 F is very close to the reported 455 from Blackstone. I'm glad you found an awesome oil and look forward to your upcoming UOA! its not the highest flash i have gotten in a uoa, but that is certainly in the top handful. yes the susvis of 67.0 makes it a 30wt (68.28 makes 40) but after 3500 miles that is pretty good. ah you got the manganese spike but not the silver spike...interesting. while the oil is pretty darn good....what is more impressive is your filter at 0.0% insoluables.. I wouldn't expect the insolubles to be too high in virgin oil. DOH this is a voa and not a uoa. Sorry Steve - didn't mean to mislead you - since both the VOA and the UOA samples were sent in the mail on the same day, I fully expected at worst the reports would return to me on consecutive business days. i was seriously wanting to know what filter gave 0.0% insoluables. When I changed the oil and took the sampe this time, it had been about 15 miles returning from the shop where they had just done a valve clearance check. ON the outside at least, there appeared to quite a bit of silicone sealant that oozed out around the valve cover gasket. Could the 30 number on the silicon have anything to do with that happening on the inside? My theory on the higher aluminum at 16 ppm is the ester oil dissolved whatever varnish buildup had formed around the rings in previous 11k miles, which likely contained fine scraped aluminum dust from the pistons, and distributed it through the oil. If this is the case, the number probably will go down somewhat next time. Otherwise, as the valve clearance mechanic with 45 years experience told me, running synthetic oil in a bike that's made for conventional is just trouble waiting to happen. 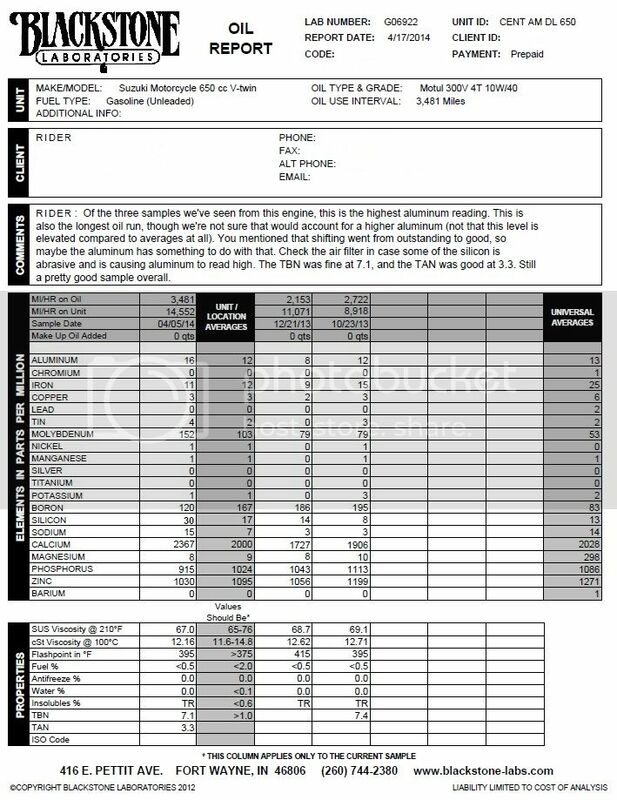 Also, for those wanting to ply the logic that a thin whatever weight oil will shear out of grade in less mileage than a thick weight oil - please compare the viscosity measurements between the VOA and the UOA. With that kind of result, it would not surprise me that Motul 300V does not use any viscosity index improvers, so what is there to shear? The viscosity at any given temperature relies on a highly stabile viscosity index, so this should be a top notch endurance racing oil. The increase of Al is interesting when comparing your previous OCI's on M1, but perhaps it could be as simple as a particle streak that will level out in your following UOA. The Silicon increase was surprising, but one thing to keep in mind is that you started out with higher levels in your VOA of 13, leaving an increase of silicon by 17 PPM. As you also stated, the increase could be attributed to the generous application of silicone sealant, plus just having the valve cover off for a valve clearance check could have allowed fine particulates floating around in the air and around the shop to also increase your levels. Even with fuel present and a subsequent decrease in flash, it maintained the exact same Sus Vis! That is quite surprising considering the fuel and 3500 mile OCI, and is quite a testament to Motul! Although a high viscosity index does help with viscosity spread, I wouldn't consider it the sole factor as this 300V is at a viscosity index of 160, while Mobil 1 is at 161, but perhaps the use of shorter chain VII's is making it more successful at viscosity retention. I too had also heard that the 300V was supposed to be for shorter OCI's (especially in race conditions), but with a TBN retention of 7.1 and a TAN of 3.3, it's in excellent shape for a longer OCI. One more thing to point out which I think is cool, is the carry-over of additives from the M1 into this analysis. 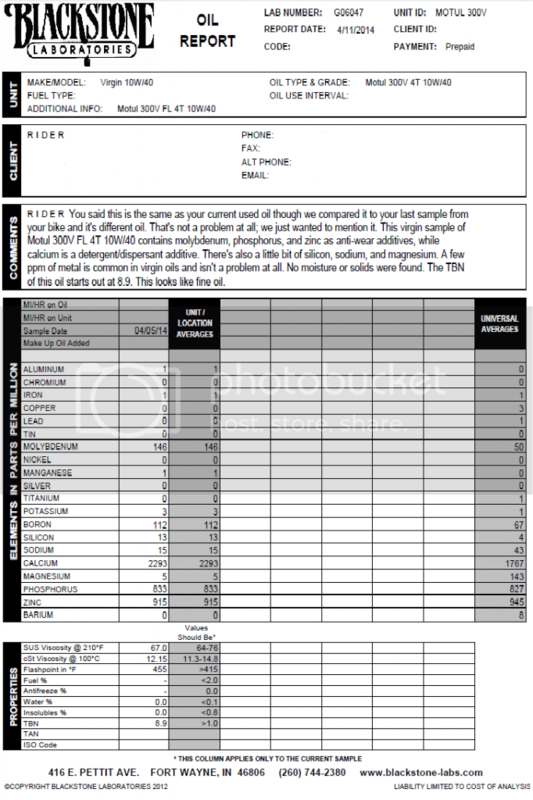 If you compare your VOA, Moly increased by 6 PPM, along with +8 of Boron, +74 in Calcium, +82 in Phos, +115 of Zinc. Last edited by Analyzer; 04/17/14 09:05 PM. not much more to add that ^^^^ he didnt already state. ya lost 60f in flash due to fuel. imho thats more than 0.5% fuel from what ive seen. yes keeping the susvis with that kind of fuel is pretty darn impressive.